As I told you, DeDe got a cold laser treatment at the vet’s office as a part of her treatment for arthritis. This is DeDe getting a cold laser treatment at the vet’s office. Cold therapy, also known as low level laser therapy (LLLT), is an experimental treatment but some find it to be effective with short-term relief from pain in joints caused by arthritis. The therapy has also been used as an alternative to acupuncture for those who fear needles. Because it is an experimental treatment, it’s recommended that you know what kind of machine is being used. Some have been found to be no more than an LED light. This is the cold laser machine used in our vet’s office. And while some tout this treatment as effective for anything from quitting smoking in humans to healing lick granulomas in dogs, the truth is there is no scientific evidence to prove it does any of those things. I’m not telling you to use or not use this treatment. I’m telling you to do your homework, as I am, in deciding if it’s right for you to use. Have YOU used cold laser therapy? Tell us about it in the comments below. And here’s a news story about a Western Pennsylvania family whose dog recovered from paralysis. Cold laser was used. Was it long-term or short-term relief? How often do you use acupuncture? Our vet has said that my sister may need to try laser treatments but we are trying some other solutions first as all that stuff really adds up in the cost dept. It certainly does. One laser treatment is $30 at our vet. Whee are going to look into this. Nibbles suffers from Arthritis which is gradually becoming worse (just an age thing). Whee find rosehip treats and supplements from our vet helpful for him as they are with hooman arthritis. As soon as it warms up whee are hoping to try more water therapy which really helped Nibbles before but whee are open to lots of different treatments.Whatever will make him comfortable really. Whee hope this is something which works for guinea piggies too! Please let us know how it goes and whether you see any visible improvements. I don’t know. I did ask about using it with Bubba cat and they said it would benefit him. Whee have done some research and it looks like a possibility for guinea pigs. Whee will wait and see whether you see some benefits! I haven’t decided whether or not to use it. Evidence is there may be some short-term relief, but I don’t know that is of benefit in the long run. I haven’t decided if I will try it. I don’t have access to a pool, so I can’t use that. That’s an interesting treatment. We hope it works for DeDe. Dottie goes every two weeks to a month to use the therapeutic laser. She has arthritis in her elbows and spondylosis in her back and it does seem to help. The treatments feel slightly warm and most of the time she relaxes into it and of course has more spring in her step when it’s over. I hope that it works the same for DeDe! We only had the common medication for arthritis – I hope the therapy will help DeDe. I don’t know if I’m going to use it or not yet. I am hoping others that have used it will offer their advice first. I hope you will find the best cure for DeDe. My experiences with the common medications were not the best, because all of the pills we got had a lot of bad sideeffects. 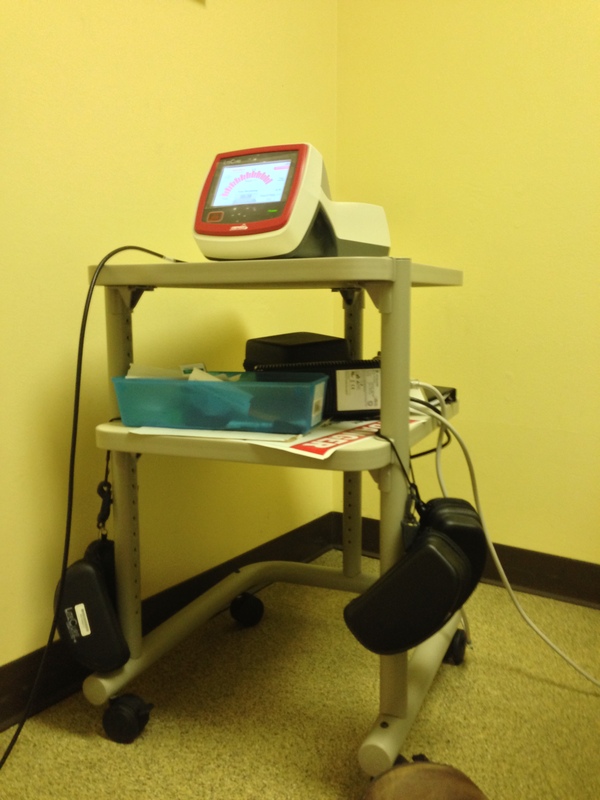 For me the laser therapy sounds good – I would like to hear more from people who tried it. We had a hot laser treatment for one of our kitties “Tora” who had been suffering from disconnection of M.biceps branchii for three months. The vet said it was very rare to happen to kitties and Tora had taken the treatment every three days for the first two months then, one a week for the last one month. Everytime he took it for ten minuite and we think he had been getting better. The vet who diagnosed Tora is said that one of the best doctor in orthopedics area in Japan and he found the cause only for 5mimutes without some tests like x-ray or blood test. He didn’t give any tablets to Tora , Tora had taken quite lots of tablets from other vets before seeing this vet though….only he told us to do was the laser treatment, so we in a way believe that ” laser treatment” might help . I hope DeDe and Bubba find a good treatment for their arthritis. As we mentioned before, Ernie was diagnosed with intervebral disc disease and he treated with a rehabilitation vet that we are fortunate enough to have near us. She did acupuncture, massage and cold laser therapy on Ernie. We think it helped him, although he was not having severe problems at the time so it was difficult to gage how much it helped him. The real test will be if he has a major issue, whether this treatment will help. As far as course of treatment, he went once a week for 4 weeks, and then another treatment about a month later before we decided to stop and wait until he had another issue before resuming treatment. FYI, Ernie’s neurologist thought proceeding on this course of treatment was a good idea. The rehabilitation vet (all she does is rehabilitation therapy) does treat dogs and cats with athritis and told the mom that she has had good success in helping the animals to manage their pain. She does other treatments in addition to acupuncture and laser therapy. Good luck. We hope Dede and Bubba can find some relief from their arthritis pain. It will be very interesting to hear what you have to say about it at the end of the treatment. See Saturday’s post. Before then I had no idea she was in such pain. It really is amazing the types of treatment they can now offer to pets. Good luck, DeDe! Gibson gets cold laser treatments often and it has really made a difference! Think of it as a “spa day!” Gibson lays out and just lets all the girls work on him! I hope it’s as successful for you as it is for him! That sure is interesting. We sure hope it works for dear DeDe. We actually saw this used on “My Cat From Hell.” A cat that had been declawed (and that had arthritis as a result) got acupuncture using cold lasers. It seemed to help her quite a bit. Sending love and hugs to DeDe, and to you all. Hoping that this treatment works on DeDe and no not familiar with this type of treatment But I have used a TENS machine which helped me is some pain relief. Also hands on healing too… Have you ever just tried doing that, Just holding your hands over the area of concern and just sending your love/Energy into DeDe…. you will either feel cold energy or your hands will warm up depending on what type of healing she requires.. Try it for 10 minutes a day and see how it goes.. Mom has worked with a vet who used the K-Laser. They would use it on ear infections, gingivitis, incisions, and all sorts of muscle and bone related problems. Mom could definitely see a difference in the animals she treated. She even used it on herself a few times. Now I will probably be getting some cold laser soon for my knees. I hope will help me and DeDe both! Looks interesting. Nice to have options. Bless, Dede I hope it works!! I have never heard of cold laser. It looks simple enough, so I hope it makes DeDe feel better. The latest remedy cats in the CB have been using is put coconut oil. You can rub it in or let the cat lick it. Bet if you research it, it will work on DeDe too. Sending healing purrz. Sending healing energy to DeDe … I had a senior girl that I wish I had known earlier to look for such treatment. I have learned a lot in the aftermath … particularly watching the benefits given to Schoep in the past year. Schoep will make 20 yrs on Saturday. I’m glad DeDe got the laser treatment. I mentioned BJ received 8 laser treatments after he fell out of my arms. The laser worked. Everyone has noticed it in the way he walks and plays. BJ also received chiropractic treatments as well. I hope DeDe is equally cured. Sure do hope it helps DeDe. Sending you prayers and good thoughts along that line. All of us here. Not sure if it is the same thing, but Mom had laser treatments on her arm when she broke it to promote deep healing. She always found that her arm was less sore on the days she had the treatments. We hope they do help Dede feel better. Interesting, I’ve never heard of this one…will investigate. The Girl’s back was injured when she was hit from behind by another car while she was stopped for a red light. 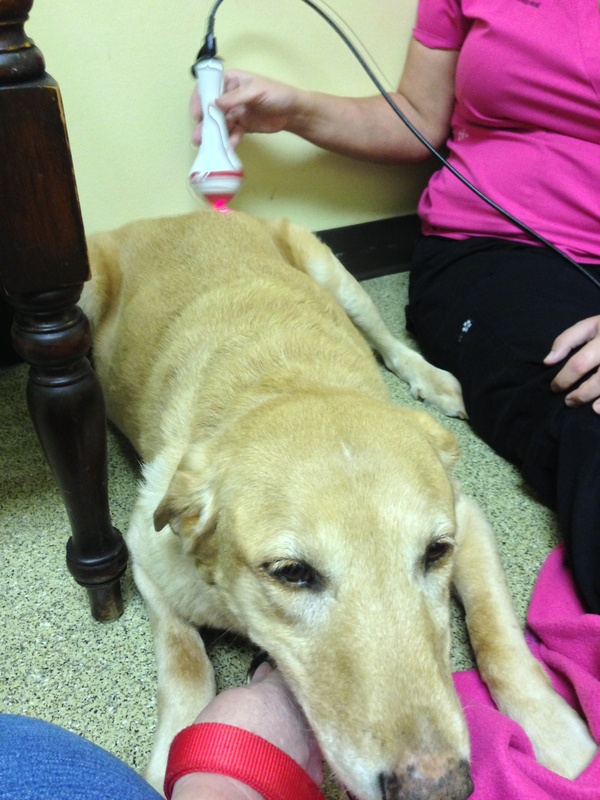 While the injury wasn’t as bad as it could have been, she went in for acupuncture and she had this laser therapy too. It was very effective. She (and I) would definitely do it again. Hhmm, I guess it’s worth a go, as arthritis is so challenging to live with. Best wishes to DeDe x. Seems interesting. We never used this where I worked… which is a little surprising because the vet who owned the practice bought every other fancy machine there was to have. There is a lot of evidence with more research studies being published every month about cold laser. I use it in my physical therapy practice and get excellent results. Lab studies have been done for over 40 years and we actually know how it works and interacts with the mitochodria in living cells. While there is no evidence that it helps people quit smoking, there is lots of scientific evidence that it reduces pain, heals wounds, reduces edema, strengthens collagen in tendons and ligaments and even rebuilds cartilage. Wish we could try this on our 12-year-old golden. Arthritis in her spine. 😦 But he’s still a happy doggy, just moves a lot slower. I think that laser therapy is a great idea to try. Yes, we used it as well and it will always remain one of the first things I’d reach for. I hope you see some benefits!